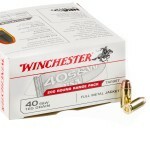 A partnership of both Smith & Wesson and Winchester led to the development of .40 Smith & Wesson ammunition with the round making its debut in 1990. 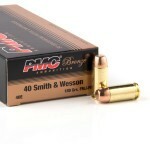 Introduced as a round that could nearly replicate the performance of the 10mm round that was used by the Federal Bureau of Investigation at the time in a smaller package, the round packs more muzzle velocity into a package that’s nearly as small as a 9mm cartridge. 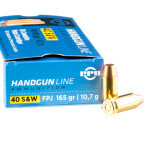 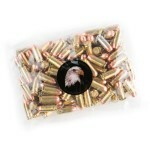 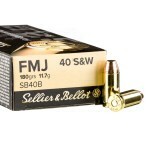 Generally, shooters will prefer to fire full metal jacket (FMJ) rounds for range training. 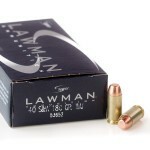 These rounds have a bullet that is not designed to expand upon impact with a target. 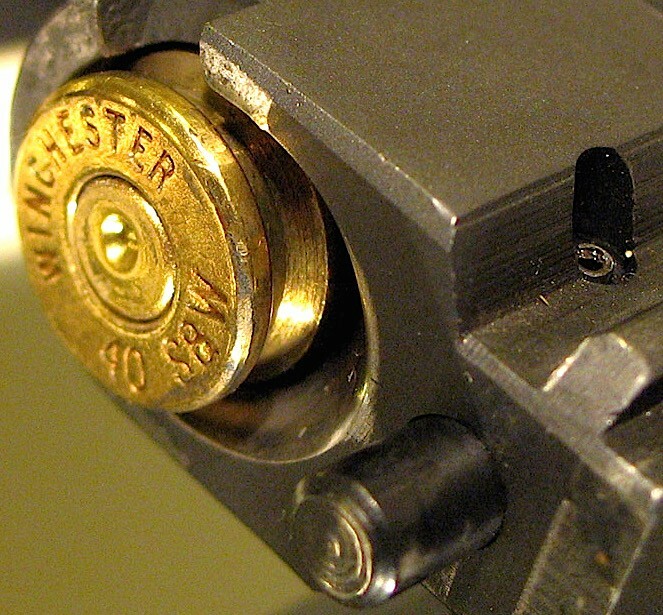 Because they are relatively unsophisticated in their design, these “ball” rounds are generally cheaper than the projectiles that are used for self-defense. 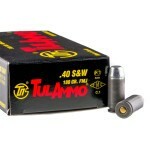 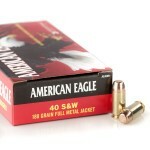 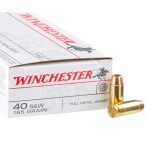 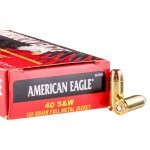 For self-defense, look for jacketed hollow point (JHP) .40 S&W ammo. 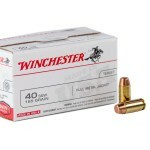 Rounds like Federal’s HST ammo, Remington’s Golden Saber or Winchester’s Defender series are all good choices for shooters looking for defensive ammunition. 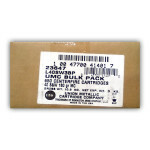 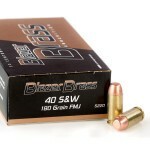 180-grain is generally considered the standard weight for 40 Smith & Wesson bullets but you’ll also find .40 S&W ammo in-stock in 165-grain weights often as well. 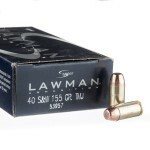 Of course, the 165-grain bullet travels faster than the 180-grain bullet and many shooters believe a 165 grain 40 S&W has lighter recoil, allowing for faster retargeting after firing. 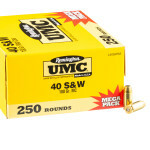 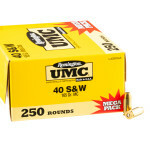 .40 cal ammo is still very common among shooters today and is one of the more modern rounds available to American civilian shooters. 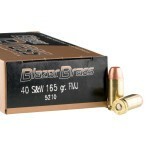 While the Federal Bureau of Investigation and other law enforcement agencies have backed off on the round because of its recoil, 40 S&W is still common among special operations units and the United States Coast Guard. 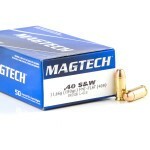 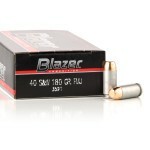 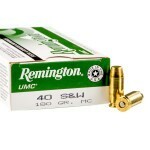 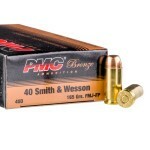 When it comes to a 40 S&W self-defense ammo, you want to look toward something with an expanding bullet. 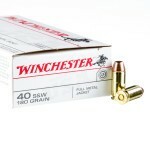 Generally speaking, this means a jacketed hollow point or some other sort of a hollow point load. 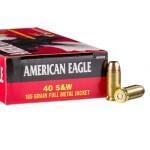 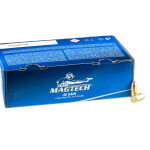 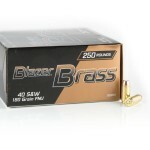 This ammo is engineered to inflict the maximum amount of damage on a target and is trusted by law enforcement and other agencies that need ammo that neutralizes threats as quickly as possible.